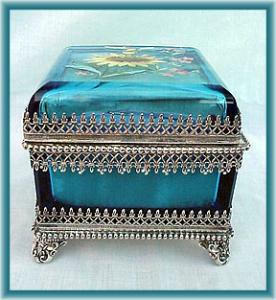 This is a beautiful American Victorian enameled blue jewel casket. The insert sits in a resilvered frame. It is in excellent condition with no chips or cracks. The insert is 4.75"x4.75" with a total height of 4". The manufacturer's mark is Forbes #505.